I got a complimentary ARC copy of this one from the agent of the author in exchange for an honest review – thank you! Kaaro, a man from the Yoruba tribe, lives in Rosewater. It’s a town shaped like a doughnut, surrounding another one, Utopicity, a place full of wonders, unattainable for most of humans. Once a year wonders spill into Rosewater and people get cured from different ailments; still sometimes the cure is worse than the disease. Kaaro works in a bank but not as a clerk. He is a living, breathing, human firewall. As a sensitive he can enter the xenosphere and see inside your mind, peruse your memories and retrieve faces you’ve seen. He also works for the local government officials as a kind of truth-finder. It is not an easy job. Sometimes the boundaries become blurred and he loses his own identity. Not surprisingly, he is also a bachelor. One happily married colleague, Bola, often invites him along trying to find a nice match for him but Kaaro doesn’t think dating is a good idea. One time his superior, Femi, forces Kaaro to look into the mind of a man who killed his cheating wife, catching her in flagrante. The experience stays with Kaaro far longer than it should – he claims he is guilty and he misses his murdered wife, a woman he hasn’t known or seen in his life. Then he is attacked by two zombies in one day and sensitives around him are dying. Why? When I started reading this one I got one big surprise. How many sci-fi novels you’ve read are set in futuristic Africa, Nigeria to be more precise? How many of them featured mostly black characters including the main male and female leads? Close to zero? Zero even? My thoughts exactly. So this one had an original setting and an original set of characters. The present tense first person limited narration wasn’t very bad although I took me a moment to get accustomed to it. I had more issues with the lack of linearity but I survived that as well because immediately I became curious about the main lead, Kaaro, and his unusual gift. When he spoke about his childhood and then his career path I was glad to tag after him because he was always willing to tell you the truth about himself even if it put him into a not-exactly-positive light. Yes, Kaaro was no saint – a huge asset in my view. More often than not saints make very boring heroes. One of more original novels I’ve been sent for review this year; perhaps even the most original one, who knows. A bit of editing and it might be really good – do watch out for this author. 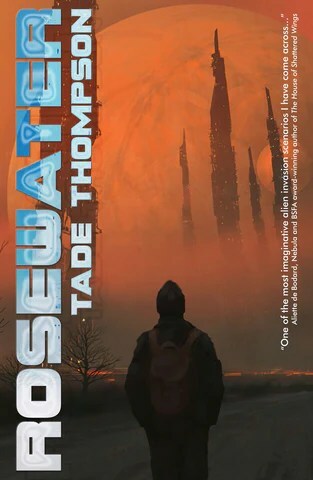 This entry was posted in ARC, book review, dystopia, fantasy, sci-fi, urban fantasy and tagged alien invasion, ARC, flawed hero, original world build, POC author or characters, rosewater, tade thompson. Bookmark the permalink. I love the sound of the premise! 2 is close to 0 anyway but thanks for those titles, I might check them out!